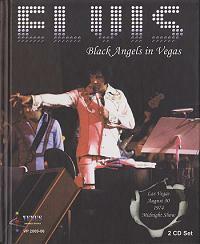 A new label, called Venus Productions has re-issued Night Fever In Vegas, the August 30 Midnight show from 1974. Two CD's housed in a coffee table book containing 84 pages with color photos and appropriate text, focusing on Elvis in 1974 and his fascination for Karate. This release provides a noticeable sound improvement compared Night Fever In Vegas, although in my opinion it is slightly off-pitched. Part of the 'Opening Riff' and the 'Closing Vamp' has been taken from August 21 Midnight show as found on Nevada Nights to good effect. All in all this is a very fine presentation. Hopefully more will follow!